Nathan here! I'm a Game Designer and freelance Pixel Artist under the name Level2Select on social media; creating character pixels and mockups for retro game ideas. Currently away studying Game Development full-time at University, my partner and I opened this Tip Jar page for those who enjoy the Pixel Art Characters posts and want to support us during busy dev times. 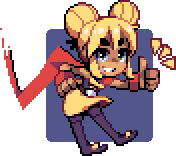 If you ever feel like buying us a coffee, hang about and enjoy some pixel palette bonuses and treats from previous posts for those interested in that little bit more. ★ Thank you for the support! I really appreciate your assistance! Here's to more productivity!